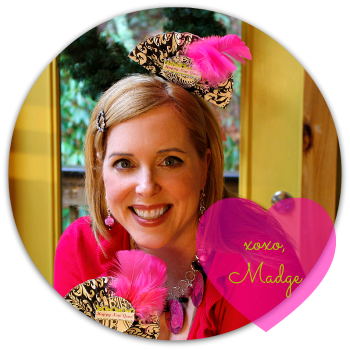 The Impatient Crafter : The Case of the Neon Pom Poms. The Case of the Neon Pom Poms. Let me preface this post with the acknowledgment that nothing below amounts to a hill of beans in the big picture, but it's some food for thought as we endlessly traverse the Brave New world of the interwebs and we navigate the complexities of inspiration versus intellectual property infringement. So what I'm sayin' folks is, I'm just puttin' it out there.. I wrote a weekly Teen Crafts column for iLoveToCreate for a year. It was fun and challenging coming up with DIY ideas I thought teens would enjoy. It helped having a super awesome stylish teen at home off of which I could bounce my ideas. She's since taken that column over and as you know, and I'm now focusing on Retrofabulous Crafts. 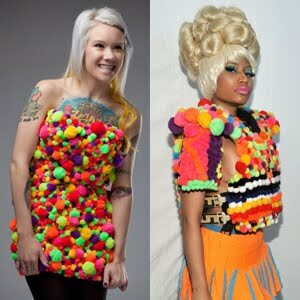 A while back I saw a picture of rapper Nicki Minaj sporting a colorful pom pom encrusted ensemble at New York Fashion Week. At the time I mentioned it to my husband, because it reminded me of the Pom Pom bib necklace he helped me construct back in July of 2010, see pic below. This design is kinda funny for many reasons. I just had to make it, even though I knew it bizarre and it has been an oft searched post on my blog for the past few years. It lives on the mannequin in my studio and makes me laugh every time I look at it. I knew it was so out there people would either love it or hate it. This blog gets a lot of interesting traffic. You'd be surprised who lurks behind the scenes here. Big manufacturers, retailers and design folks you would surely know if I named them. They are, like many of us, always out there looking to see what is new, what is happening, who is doing what and...they are seeking inspiration. My work has been copied, I've seen it in catalogs, magazines, blog posts, winning design contest entries and even in showrooms in NYC. Does it burn my biscuits, yes, a little. It would be nice to get some credit, but at some point things just get out there and no one knows who thought of it first. What can I do. I just keep coming up with new ideas. Gluing pom poms (or alternately pom pons) to felt and making it into jewelry is not an amazing feat of creative ingenuity. I admit I thought myself rather clever and it did take some thought figuring out what substrate would work best for both strength and comfort, how best to array the bib of felt circles, what adhesive made sense and how to connect it all together so it hung properly when worn, but it's really not a giant design stretch. And let's face it, most folks would probably not follow through with an idea this...well...utterly defiant of good taste. Lord knows, I am not afraid to dance on the edges of Tacky Town. I have had pom poms in my crafty coffers for years and this idea was rolling around in my head for a long, long time before I finally decided to try it. Had I seen this idea anywhere else before posting this project? Nope. If I had, I would have credited the inspiration source. It's how I roll. So imagine my surprise when I Googled 'Nicki Minaj pom pom outfit' yesterday and found a slurry of articles from this past October including this one on Perez Hilton's Coco Perez site in which another designer very publicly accused Minaj of pom pom plagiarism. You can see the two outfits side by side above and it's obvious there are distinct similarities, but also some notable differences. Nicki's vest looks almost like a funky version of a traditional costume you'd see somewhere in Russia or Mongolia with patterns and stripes in various colors, the top next to it has more of a funky club kid vibe and is all from the same bag of pom poms (I know because I have the same bag.) You will also note the similarities to my bib necklace. Ms. Rogers claims that she was contacted by Minaj's stylist, sent pics of her work for review, never heard back and then saw this outfit in the fashion pages. So there is a thread there and reason for concern and I have no way to substantiate her claim. It is completely possible she and I simply looked at a 100 pc. bag of Darice Variety Pack neon pom poms and thought, "Those would be fun to wear!" Or it's possible that this concept is not that much of a design stretch. I know I had not seen her idea before I made my necklace. Reading my stash of vintage craft magazines is really making it clear to me that so much of what we think of as new and fresh and unique is really not. If you can stitch it, glue it, collage it, attach it, layer it, adorn it...well someone has probably had the same idea somewhere along the way. Try coming up with new names for websites or products, every clever little thought you have you will probably be able to find in a search. Ideas are, in my opinion, out there. We often tune into their frequency without knowledge of anyone else doing so or having done so. Some folks look at a bag of neon pom poms and think..."ACK!" Others look at the same bag and think, "Ooooo! FUN!" What do you think? Is it a coincidence, this convergence of pom pom-ery? What constitutes an original design idea and does this idea fall into that category? Can one own clustered and glued neon pom poms, really? Does any of this matter, even slightly...probably not. Still it's good food for thought. 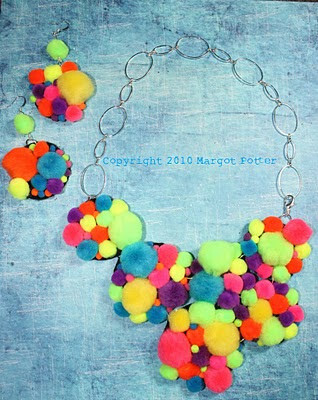 Oh and if you'd like to put together your own playful pom pom necklace, here is a link to the tutorial! The pom pom's are so fun! They sell them in my local $1 store, and i'm always drawn to them. The pics are great! Would love to make a necklace like that with my neices. In the 80's my Aunt Wendy and I glued metal pieces to vintage replica paper. She found an old watchmakers cabinet with pieces which she glued on all kinds of stuff. I laugh every time I see the word steampunk since we did that almost 30 (OMG) years ago. I am an Australian artist who works with pom poms in my sculpture practice. Please check out my work. After I posted this I found one of your FABULOUS works of art on Pinterest and pinned it. LOVE your work! Thanks for stopping by.